This is long overdue from my Disneyland series, but better late than never! I wanted to give Cars Land at California Adventure its own post. 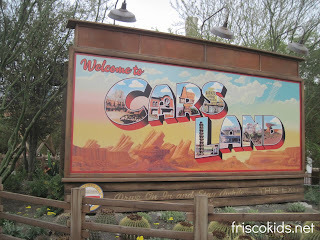 I have to say, Cars Land was ADORABLE. They did a fabulous job recreating the scenes from the movie and making them come to life. 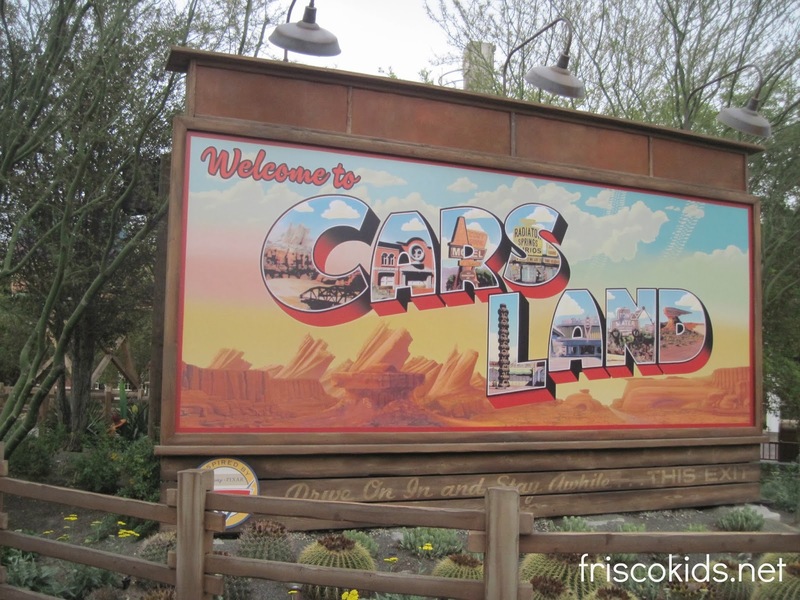 The Cars Land sign is at the entrance to Cars Land, not surprisingly. Notice the barrel cacti below - the landscaping was authentic. 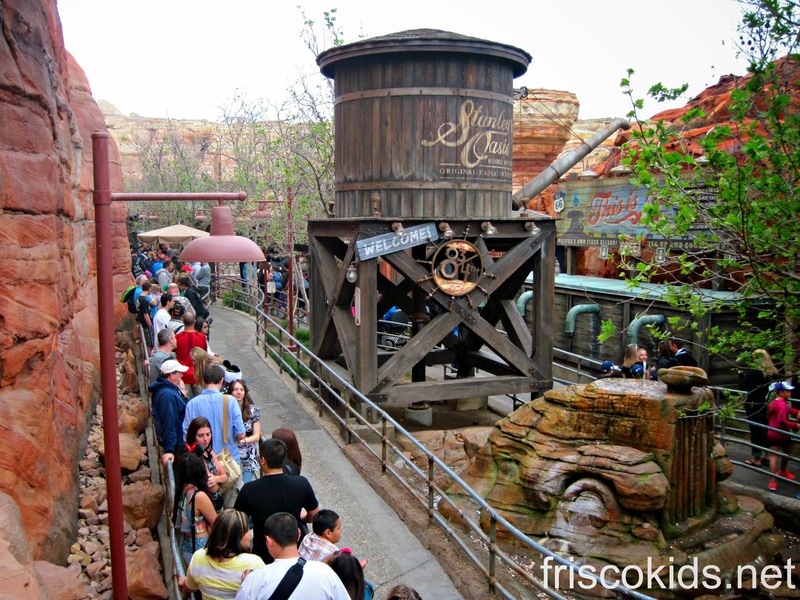 walk into the park at opening bell (though it had been open early for those staying on property), to see the Fast Pass line for Radiator Springs AN HOUR LONG. Not kidding. 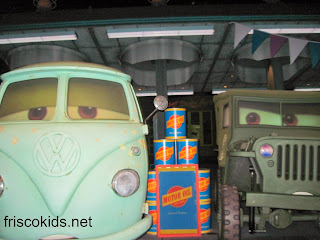 The Fast Pass ticket machines are near the entrance to a Bug's Life on Buena Vista street. 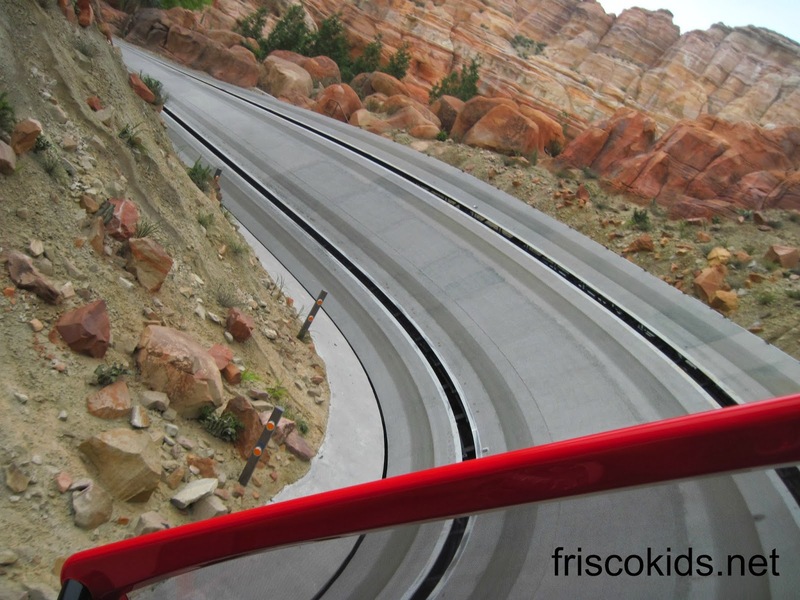 Cars Land is past that. But people lined up from the ticket machine, down BV street to the Carthay Circle restaurant (where this pic was taken), and around the corner and down the street, pass the Disney animation building and around the corner going toward the Tower of Terror. We looked online at our trusty Disney apps to see that while the Fast Pass line was an hour, the stand-by line was only 20 minutes. Fortunately our kids are old enough not to freak out riding alone. We talked to them and said it's that, or we wait an hour in line now, and more time with Fast Pass. 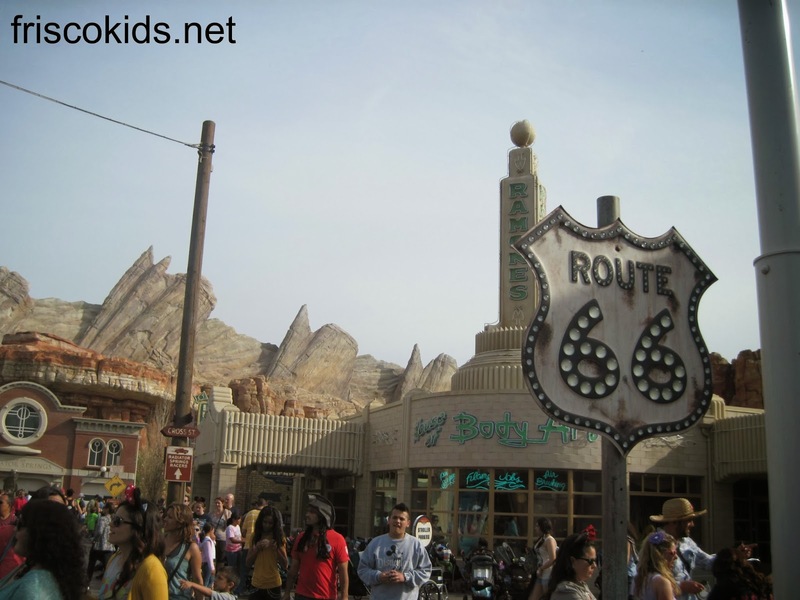 Then we almost ran to Radiator Springs. Forget looking at Cars Land while we went through. Nope, we just got in line (well, we got in line, but my brother-in-law ran to get us all Soarin' over California Fast Passes and then met us in line). 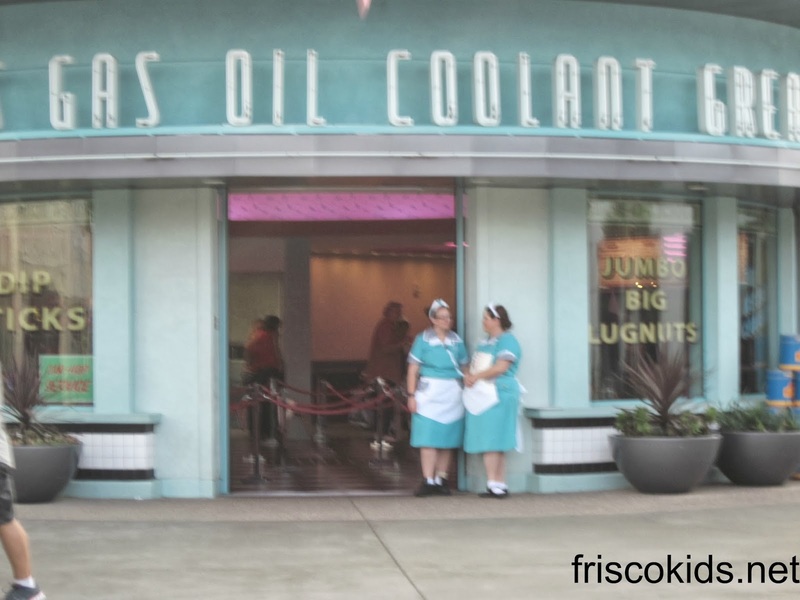 It was very confusing because the line for everyone, (I can't recall if Fast Pass people had to wait there with us), went down the main Cars Land street, and the employees, er, cast members, didn't want anyone walking ahead for any reason. 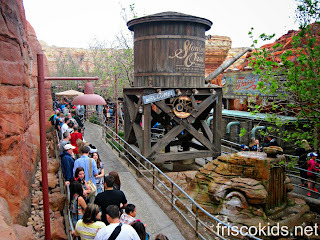 Once we got to the corner to turn into the Radiator Springs line, they allowed us to move to the single rider line. I asked if we could have just gone over there earlier, and they said no. They're trying to maintain some order, so everyone has to wait in the long line. It was frustrating. The line was gone later in the day, even though the regular lines were still long. That said, once we got in the standby line, it was about 20 minutes for us (and much much longer for everyone else). 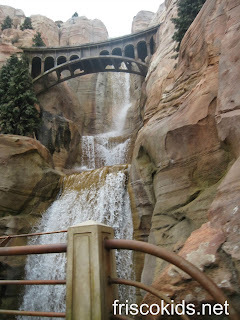 You can see they did a nice job with the scenery in line. We also were along the track at one point, and got to watch the cars zoom by at various times. And lots of cacti with blooming flowers. Very pretty. The cars are all a little different. There are six to a car - three in front, three in back. Though we were stand-by, 4 of us managed to ride in the same car (different row) with someone from our group. Once buckled in, we took off. 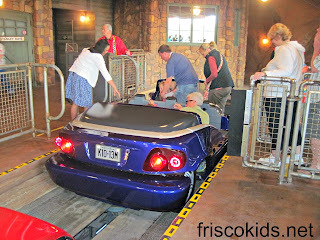 The ride concept is very much like Test Track at Epcot, if you've been there. Read more about how Radiator Springs Racers works, from a Disney electrician. The vehicle gets electricity from collector shoes under the vehicle, like slot cars some kids play with. The ride is not quite a roller coaster, but something unique. The first part of the ride took us through the mountains, and past a waterfall, driving at a good rate, with the wind in our hair. Then we went inside into Radiator Springs. Part was dark, with stars in the sky (a little scary for one kid in our car). The cars talked and moved around, just like in the movies. At one point we entered the garage (below) and the car either got new tires or something else (oil change, I think). It's seemingly random what happens when you go in. 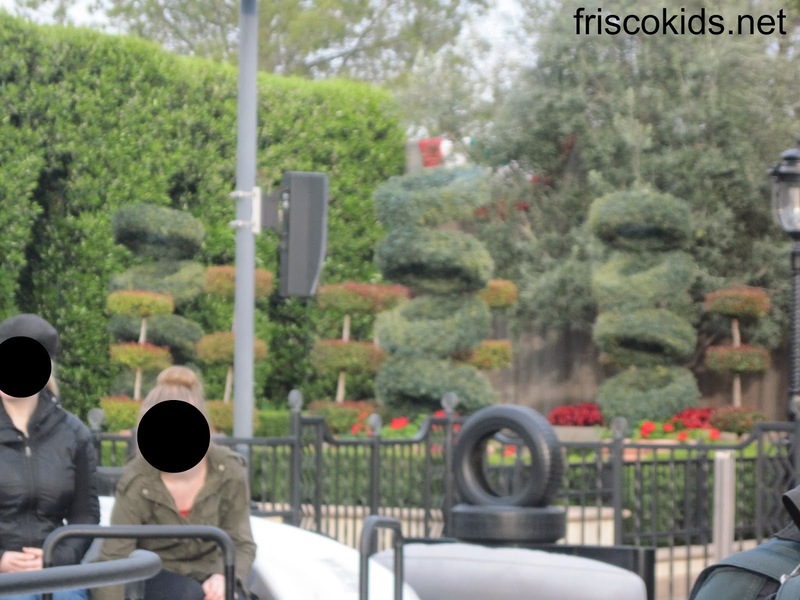 Both times I went on the attraction, the same thing happened, but someone in my group said they had a different experience. 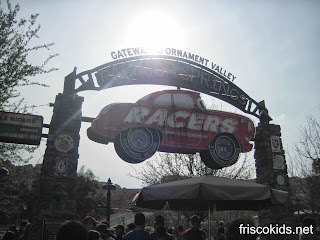 From there, we challenged another car (the one next to us) to a race, and that was awesome, except for the little kid in the car who was bawling the whole time. It was fast, up and down. Very fun, and great scenery, even though it's fake. 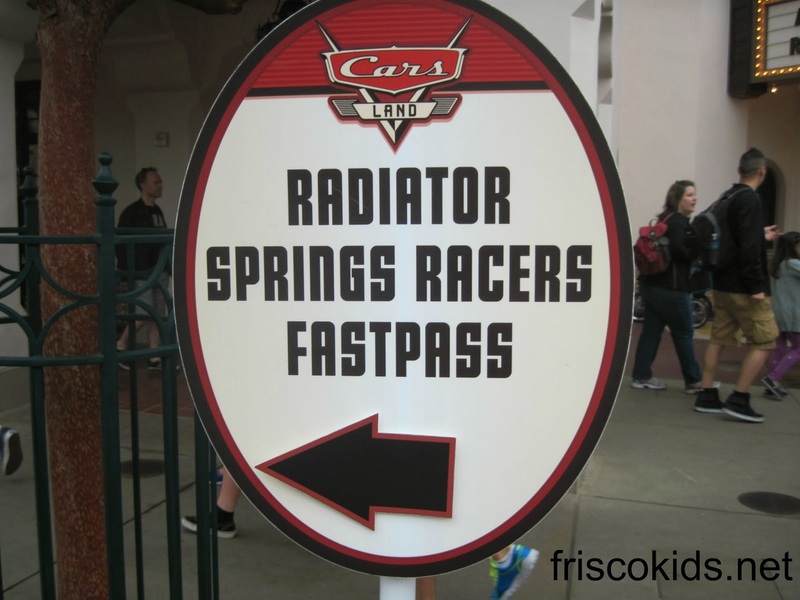 Everyone in the family agreed that Radiator Springs was the best ride for us in Cars Land, and in fact the only worthwhile one, since our kids were 9+. The picture below is where we waited to get onto the initial line for Radiator Springs. The line wasn't there later in the day. I think that's a store below. This gas station is actually a restaurant, and you can sit outside to eat. Cute, huh? 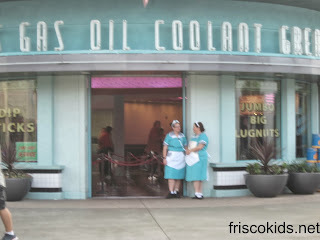 Here you can see the waitresses from the gas station/restaurant. I think it's a fast food place. 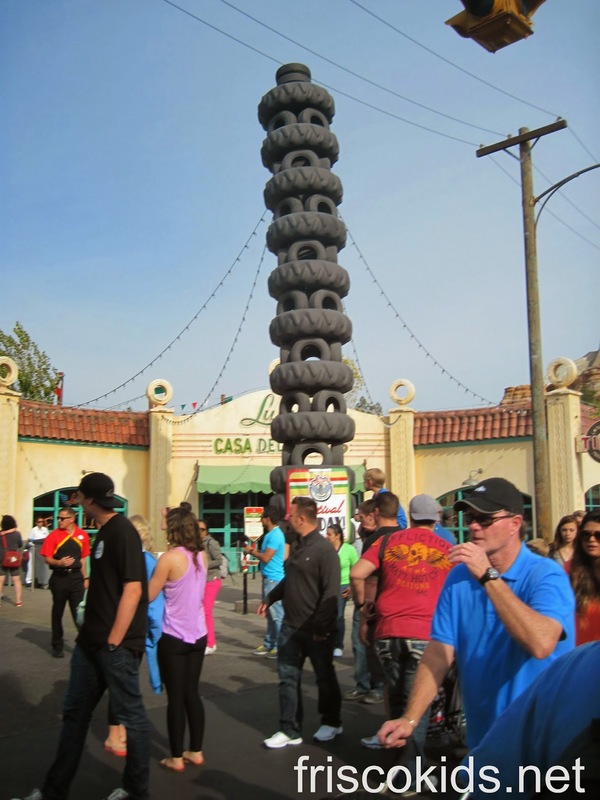 Below is Luigi's Flying Tires ride. The outside is adorable, with the tire sculpture you're not allowed to climb on. We got in line when it said a 20 minute wait, but they lied. It was about 40 minutes, and we were kind of annoyed about that. Especially because the ride wasn't very good. If you have to wait in line inside, this is what you look at - tires. Kind of cute set-up. 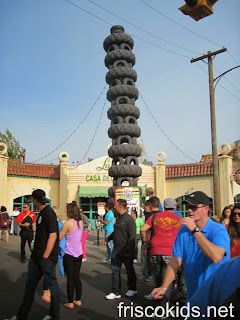 You can see how long this line can get - through the building and outside into the tire sculpture plaza. From here you go outside, into another string of lines. 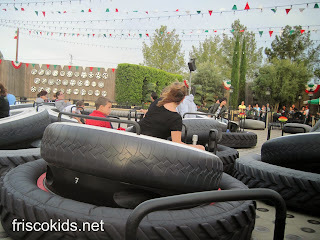 Okay, so now we're actually on the tire ride. 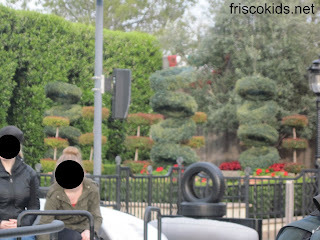 I really liked the topiaries shaped like tires. Very clever. 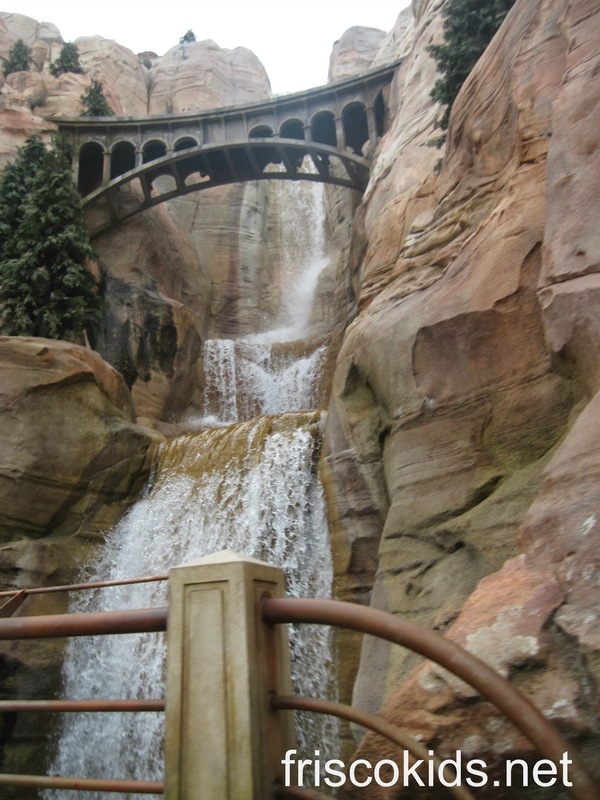 I wrote about Disney's landscaping and gardening here, if you want to learn more. I cover topiaries in it! Luigi's Flying Tires uses similar technology to Disneyland's old Flying Saucer ride (before my time). Air is blown through the vents at the bottom (see two pictures below this one), and the tires are moved by leaning in different directions. 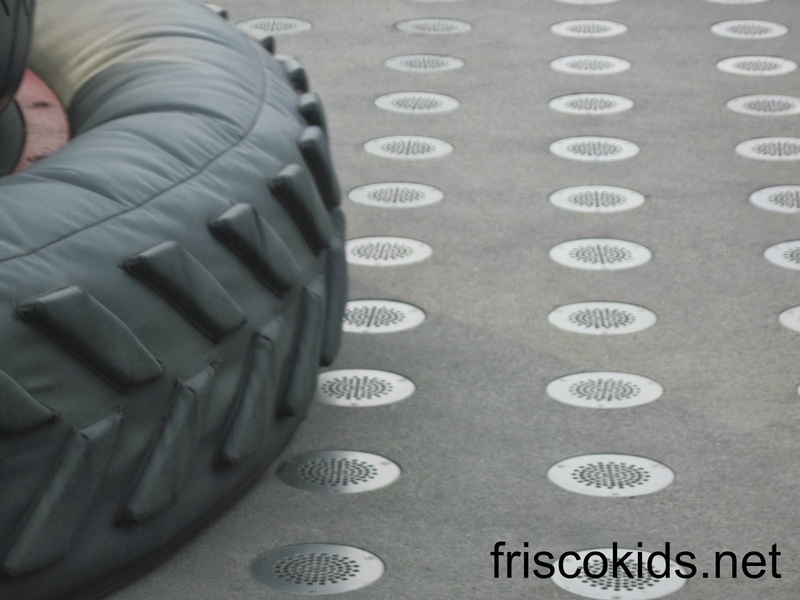 It's like bumper cars, but with big tires. Below you can see the air vents. We didn't think the ride was worth 40 minutes wait - maybe 10 minutes, but we weren't impressed by it other than the concept. 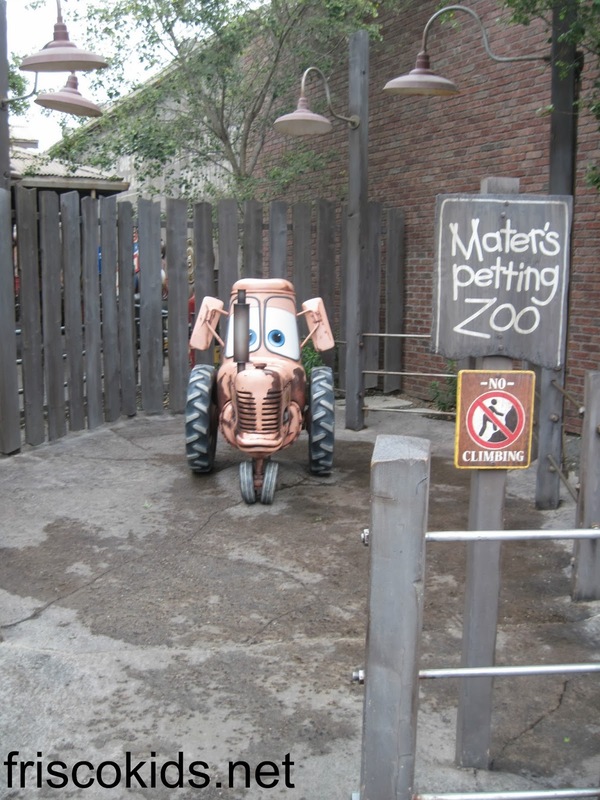 My kids are too old for Mater's Junkyard Jamboree (the dad in this Disney photo appears to be having too good a time), and they wouldn't pose with Mater either. 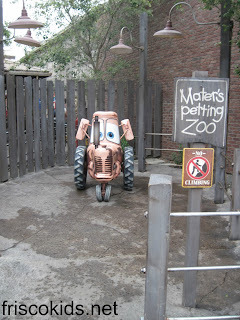 I find it ironic that you're not allowed to climb on Mater here - good luck with that one! 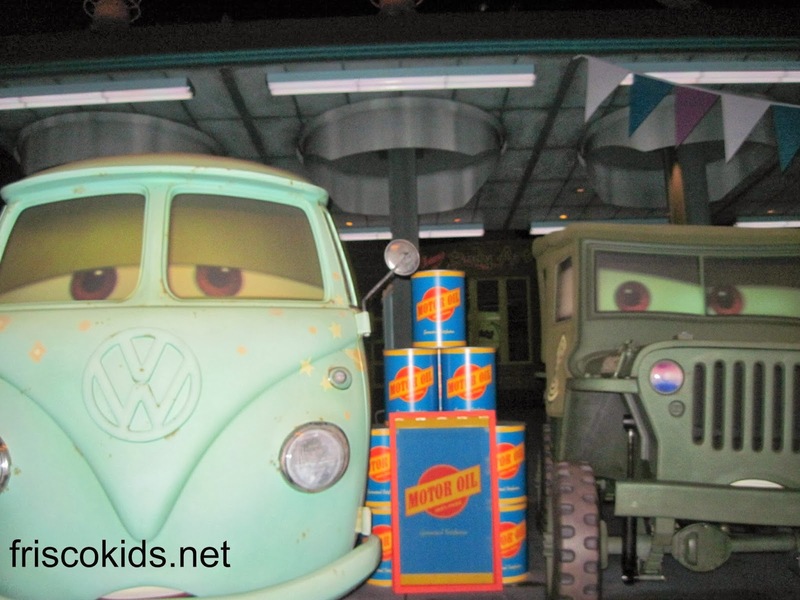 Throughout the day, they brought through different Cars characters (the actual cars) through the streets and you could take pictures as they drove by (and you had to get the heck out of their way). 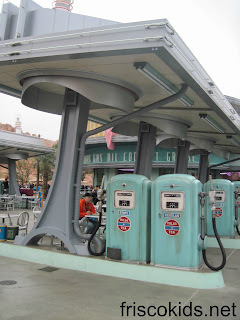 Aside from Radiator Racers, what I liked most about Cars Land was how they executed the look. It looked fabulous. 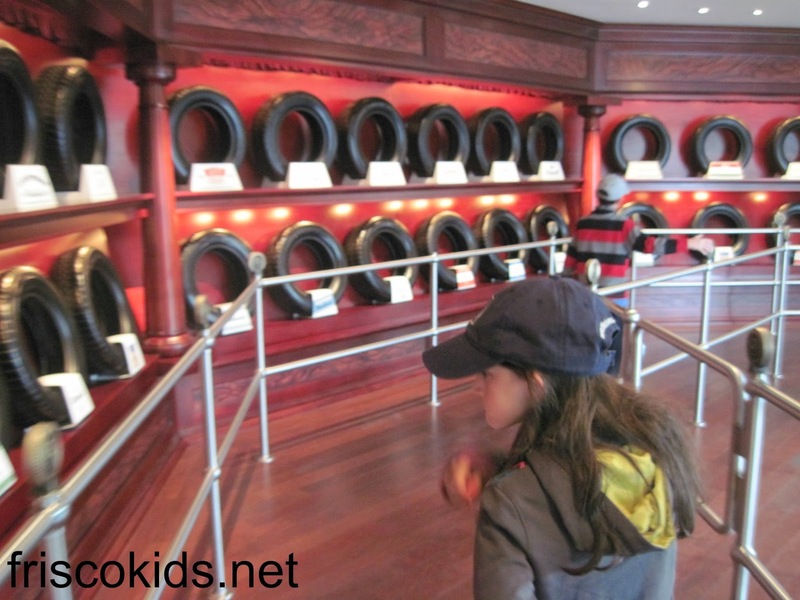 I'm sure the younger set who are in the Cars phase will love every second of it. 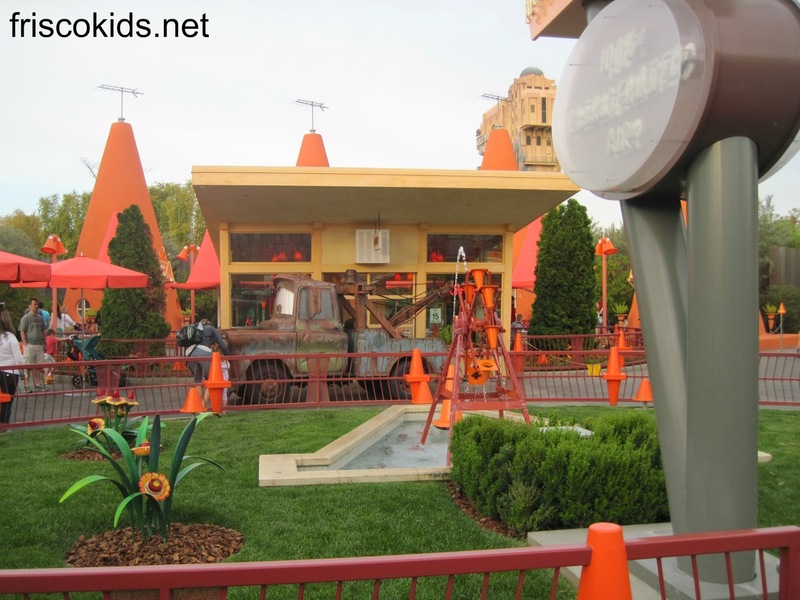 Here are some other Disneyland and California Adventure posts.